Former finance minister Ignatius Chombo, currently in remand prison and facing a litany of corruption charges, is reportedly under investigation over the unprocedural construction of a business complex which accommodates CBZ Bank in Pomona, the Airport Road scandal and corruption involving land among other allegations, the Zimbabwe Independent has learnt. 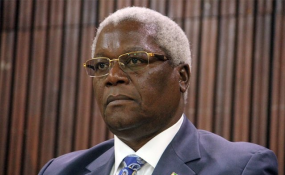 Sources said the Central Intelligence Organisation, which compiled many reports on Chombo's alleged corruption, had forwarded the documents to police for investigation. Chombo was arrested last week after being dumped at his house by the military which seized him as part of Operation Restore Legacy which saw soldiers storming some ministers' houses and confining former President Robert Mugabe to his Blue Roof house. He has appeared in court twice facing corruption charges and has been remanded in custody to December 8. Sources said the police were investigating various allegations laid against Chombo over the years including those which the authorities deliberately turned a blind eye to, because of his close relations with Mugabe. "At one time a dossier was prepared to and handed to Mugabe by the CIO for actioning but instead the president went on to appoint Chombo as Home Affairs minister. This was seen as a clear message that he was untouchable." During the inclusive government era, former Prime Minister Morgan Tsvangirai, also urged Mugabe to allow Chombo to be investigated for corruption allegations but Mugabe declined. Investigations during the inclusive government era into the US$80 million Airport Road construction saga, Harare city councillors uncovered evidence that a controversial Estonian company, Augur, was being used as a conduit to fleece the municipality of millions of dollars and vast tracts of prime land. Chombo, senior council employees and a caretaker commission which ran council affairs in 2008 were implicated. Copies of the council report compiled after the investigation were sent to Tsvangirai and parliament for further investigation. Council also threatened to approach the Anti-Corruption Commission and police. The case against Chombo was strengthened when investigations revealed that a company owned by Chombo, Harvest Net Investments, shared the same address as Augur at 62 Quorn Avenue, Mt Pleasant, Harare. The Airport Road deal was signed in 2008 and the project should have been completed in 2010 but missed targets due to abuse of funds. The project was eventually completed in 2014. Chombo is also accused of fraudulently acquiring stand number 61 of Helensvale (also known as stand 61 of Glenlorne) which measures 193 716 square metres and another piece of council land, subdivision K of Nthaba, which he sold to a third party without paying for it. Documents seen by this newspaper show that stand 61 was reserved for recreational purposes and it was not supposed to be sold by the city council. "On October 4 1990 a full council meeting resolved to subdivide stand 61 and sell it to people on the housing waiting list as serviced stands," reads part of the document. "In June 1994 the decision to subdivide the stand 61 of Helensvale was rescinded after objection from the residents of Budleigh Park," reads part of the report presented to the Serious Fraud division of the Criminal Investigation Department (CID) under case number IR 0407725 by the then acting mayor Charity Bango. The documents also show that several applications by companies and individuals who wanted to buy the land were turned down, citing the resolution of the council pertaining to the use of that particular piece of land. Apart from Airport Road, other projects under Augur included the Pomona Business Complex and Bluffhill Development which, according to the Harare City Council, were approved in violation of the Regional Town and Country Planning Act of 1996. It has now emerged that the City of Harare's Highlands District Office had in 2012 called for an investigation into the construction of a multi-million-dollar commercial business complex in Pomona. According to a letter to the urban planning director Psychology Chiwanga by the Highlands District Office on April 26 2012, Chombo gave the go-ahead for the complex to be built without council approval. In the letter, the district manager said the construction of the business complex was not above board. "Subsequent to a site visit made on 23/03/2012, a recent follow-up site visit on the 17th of April 2012 revealed that the Chinese developers are constructing a commercial building which I am informed accommodates CBZ Bank, etc, on a stand zoned residential according to Borrowdale Local Development Plan Number 32," reads part of the letter. In another case, ER-09/2011, Chombo is said to have sold council land to a third party without paying for it. Documents reveal that on June 25 2004 the secretary for the Ministry of Local Government and National Housing, only identified as Simon Pazvakawambwa, wrote to the city valuer and estates manager, identified as Fransisco, requesting that subdivision K of Nthaba Glenlorne be transferred to Chombo. "The above stand was allocated to Dr. I.M.C Chombo in 1995," reads part of the letter dated June 25 2004. On September 19 2005, Pazvakawambwa wrote another later to the city valuer giving details to effect the land transfer however contrary to his earlier letter where he alleged the land was allocated to Chombo in 1995 he stated that the land was bought for "Z$6301 on January 1 1997." After acquiring the land, Chombo went on to sell the stand to Alois Ndziva Chimeri on September 5 2003 "for Z$250 000 000 and the purchase price was paid in full." Questions have also been raised over Chombo's wealth. In their divorce papers, Marian claimed she and Chombo owned businesses, farms, homes and residential stands in Harare's leafy suburbs of Mt Pleasant, Alexandra Park, Greendale, Borrowdale and other towns around the country, luxury cars and vast tracts of land.